I want to take a few minutes to not only thank you both for the amazing job you did in marketing and selling our beloved Krogen, but to also help inform potential clients of yours about some of the techniques and care that you used which made the entire process so rewarding. 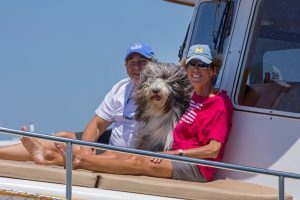 Debadoo is a 1998 KK39 with a rich history of being used to explore the eastern US coast and rivers from Florida to Maine, the Great Loop, the Bahamas and beyond. Most brokers (including Krogen, the manufacturer) would either use photos from the owner or past photos from previous brochures to market the vessel. Then they would use a write up about the boat often cribbing from other listings for the same type boat. All in all, the approach they seem to use leaves you with the impression that no matter how you feel about your boat, to them it’s just another boat, only worth what any other similar boat has recently sold for. They claim to be experts and then manage you rather than take seriously your thoughts and concerns. Basically, they do the bare minimum and then assume that by posting to YachtWorld, etc. they will get a prospect who they can close. Enter the Jeff Merrill way of marketing a boat. Christopher already knew the boat as we were docked together with his Krogen Sweet Ride. None the less we started with a thorough walk through – noting things to be addressed, items to be removed and any issues that needed obvious attention. Next a highly talented photographer (Christopher’s wife, Alexandra!) was brought in to professionally photograph the boat. Jeff happened to be in Stuart at the time and came by for a look. He immediately decided that Debadoo showed so well that a video should be put together. In a couple of hours with Jeff and Christopher after showing me how to record, we shot the video. Then Jeff had it professionally edited and even spliced in some nice footage I had of the boat running up the Chesapeake. As for the descriptive content, Jeff encouraged me to take a stab at the cover story. Who knows the boat better than the owner? If there is a story there, you should try to tell it. How was the boat used? maintained? etc. Finally, the entire listing was loaded to its own landing page within JMYS and linked to every posting on YachtWorld and a dedicated Debadoo Krogen 39 listing site. The result: We identified a buyer within a week of hitting the market. The buyer had agreed to a deal on a similar boat (a sister ship KK39 which failed a survey) and which was priced significantly less than Debadoo. Jeff and Christopher methodically executed a fact based strategy to get the buyer comfortable with paying what we felt the boat was worth. We all knew the boat was worth the extra money, but getting the buyer to embrace that is not an easy task. Christopher took the lead and stuck with working the prospect for nearly two weeks talking with the buyer’s broker and kept us informed at all hours of the day and night. On inspection day, Jeff showed up and provided careful guidance in dealing with the inspectors (hull surveyor and diesel mechanic) and in following up with the buyer’s broker to insure that any concerns were addressed quickly and completely. All in all, the listing and selling process was a wonderful experience. I would not hesitate to use Christopher and Jeff again for our next purchase or sale. Thank you Jeff and Christopher for a masterful job. Please feel free to use this letter as a testimonial to your great service.